Dwayne Perreault – To continue from my last posting, which had more to do with the viticulturalist aspect of winemaking, I will now turn to the actual making of wine, which begins with the process of adding yeast to the grape juice, the basis for the wine. Mas des Dames, being an organic estate, wishes to avoid using yeasts which impart flavours, so "levures naturelles," or natural yeasts are used. These actually come from Syrah vines from Guigal in the Rhône. The question might be asked: why not just use natural yeasts which exist in the vineyard, but oenologist Xavier Billet explains that this at all costs is to be avoided. Some of these yeasts may be from the Saccharomyces cerevisiae family, but others (Brettanomyces, etc.) not. These are unpredictable yeasts which can rapidly turn wine into vinegar, or not. But one chooses for certainty. The adding of yeast is a delicate process. One kg of dried yeast (for 50 hl, or 20 gm/hl) is added to a 10 litre bucket of water at 35° Celsius and left for an hour. Before adding the yeast solution to the vat of grape juice, special care must be taken that the temperature of the yeast solution and that of the grape juice do not differ by more than 10° Celsius, otherwise thermal shock could ensue, which can hinder or even stop fermentation. 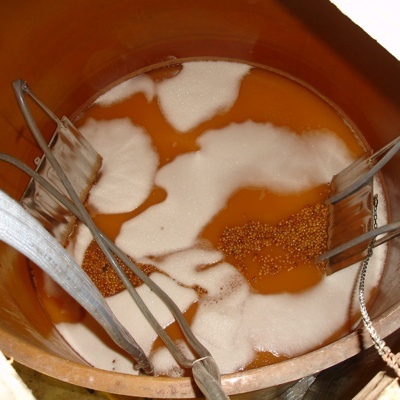 Since the yeast is alive and writhing and foaming in the bucket, it does not lose its temperature quickly. To help matters, after an hour we add gradual portions of the cooler grape juice to the bucket, to bring down the temperature. Once the yeast solution has been added to the vat, fermentation begins. Before long, the vat of grape juice begins to change, with a fine mousse growing on top and becoming thicker by the day. After 48 hours of fermenting we perform our first débourbage, or removal of the lees, the dead yeast cells which collect at the bottom of the vat as sediment. This is done by climbing up a ladder to the top of the vat and inserting a large hose into the tank, thus pumping the clear juice into another vat which has been sealed with CO2. 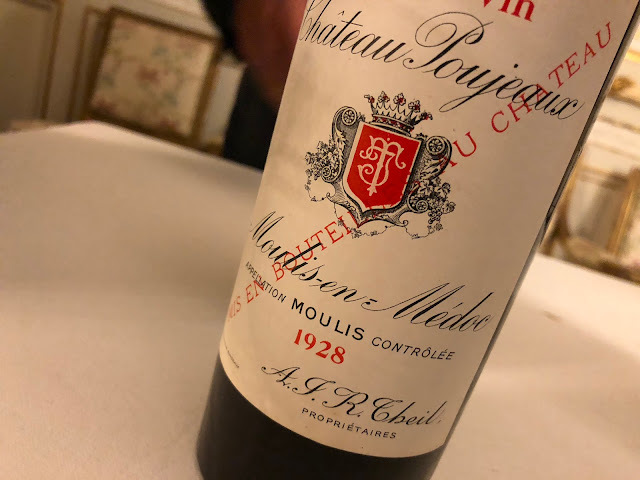 One could of course choose to vinify sur lie, or with the lees, possibly even pumping over twice a day, the macération sur bourbes, which provides thicker wines, but Lidewij chooses for pure fruit expression and freshness. Samples are regularly taken from the fermenting vat to measure the density and temperature of the must, the now fermenting grape juice. The sweet pure grape juice contained a lot of natural sugars, which have a higher density than water, precisely 1100 at the beginning of fermentation. These sugars are the food for the yeast required to make alcohol, and as the sugars are converted into alcohol the density of the must will decrease, while its temperature will increase. 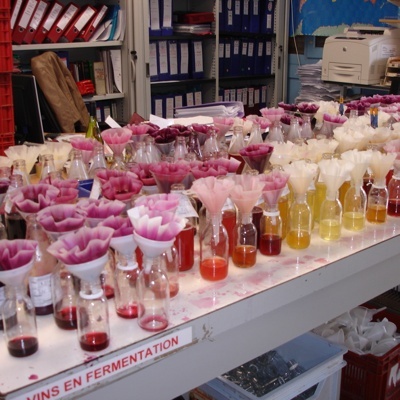 Samples of the fermenting must are also taken by Xavier Billet to a laboratory in Béziers to receive a total analysis. Xavier is one of six oenologists for the entire Départment de l’Hérault and all indications point to the Mas des Dames Blanc being a healthy, fermenting wine. But the wine is not only fermented in the vat, it is also fermented en barrique, so after several days it is pumped over into oak barrels, after which it is fined with bentonite. The use of new oak is eschewed, which leads to a more subtle oak influence in the wine, round but with freshness. Our work in the vineyard was in the meantime interrupted twice by heavy rains, on August 31st and September 4th. This inopportune rain puts harvesting behind schedule, as the grapes become gorged with water (and predisposed to rot). A delay in work means the pickers don’t get payed, and this can become troublesome in trying to keep a team together. Many pickers are itinerant workers, and they know that by driving to the Médoc they could work for two weeks without stopping. But on September 7th we harvested some choice plots of Syrah to make the rosé. In total we had 21 hl of delicious juice, 19 hl after débourbage. Once again, with the rosé we are only vinifying the dark pink juice, which has had only a short maceration with the grape skins. In other regards, vinification is the same as the white wine, although only 10% of the rosé receives oak ageing. And at this point, on September 12th, my apprenticeship at Mas des Dames came to an abrupt end, as I had to leave. The work was not yet done, as the vinification of the reds was about to begin. I hope to return another time to finish what I had started. My thanks to Lidewij van Wilgen for giving me this opportunity, for her instruction and answering my many questions. Special thanks to Xavier Billet for the same and for giving me a guided tour of his laboratory. It has been a great experience and I look forward to coming back. I also look forward to tasting the 2011 Mas des Dames when they are released! In the meantime, the 2010 white and rosé are still available at Wijnhuis Zuid, as well as the 2009 La Dame and the 2007 La Diva.